In collaboration with the British Embassy Bangkok, the Thai Department of Land Transport is working to improve the process of obtaining a driving licence for foreign nationals across Thailand. These improvements contribute to a wider goal of tackling road safety in Thailand, with an aim to cap the rising number of foreign nationals involved in road traffic accidents. Improvements will focus on guidelines for obtaining a driving licence; how to prepare for the driving test; raising awareness of specific risks on the road unique to Thailand; and recaps on internationally-recognised driving standards. Reducing the number of road accidents involving British people in Thailand remains a key priority for the British Embassy. 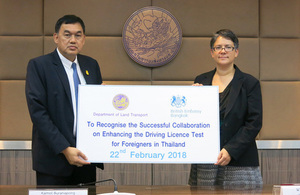 This important collaboration illustrates a shared aim of improving driving standards and raising awareness of specific risks on the roads, through developing engaging and accessible materials to aid the driving test process that not only British people will benefit from, but also any other foreigners residing in Thailand. Department of Land Transport sees the importance in creating the understanding for foreigners wishing to attain a Thai driving licence. This collaboration with the British Embassy Bangkok on this Road Safety initiative to improve process and standard of licencing process will help enhance the understanding for foreigners and, meanwhile, protecting their right as a road user under Thai laws. Foreigners can receive a Thai driving licence with the same standard procedures with any other vehicle types by receiving training about relevant laws, rules for using roads in Thailand, written and practical tests. Based on a survey conducted with British customers needing consular services, the partnership has helped kick start three initiatives that include the production of a 45-minute English language instructional video, covering road traffic laws, road usage, techniques for driving safely and driving etiquette. This is a part of the Thai driving test for foreign nationals. Other initiatives are the production of a 3-minute English language video explaining the process for renewing, transferring and applying for a driving licence as a foreign national and re-translation of the online driving test for English speaking applicants. The Department of Land Transport will use these materials for English speaking applicants at all driving test centres and transport offices across Thailand. This will ensure that foreign drivers are aware of road safety rules and regulations; the consequences of their own behaviour to themselves and to others; and law enforcement in Thailand. Thailand welcomes just over 1,000,000 British visitors each year and it is also home to over 50,000 British people and their families. Safety for British people visiting, living and working in Thailand is a key priority of the British Embassy Bangkok, with road safety being an important aspect of this. Last year (2017), 5% of total casework (71 cases) from the Consular Department at the British Embassy Bangkok involved providing assistance to British people involved in road accidents. The top five provinces for road traffic accidents involving British people are Surat Thani, Phuket, Chiangmai, Chonburi (Pattaya) and Bangkok.